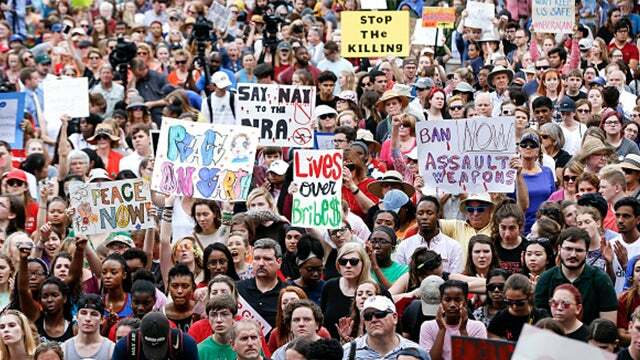 RUSH: I’m just watching the rally up there, ladies and gentlemen, and the students at the gun control… I’m sorry, the students… I don’t know what they’re calling it, but the chant now is “NRA, we are not afraid of you!” “We are not afraid of the NRA!” Everything that is happening here is furthering the idea that it has been hijacked and is in the process of being taken over by the Democrat Party. I don’t know how you can say otherwise with some of these slogans that we’re seeing and some of the words that are being said. I want to remind people something about the NRA. Sometimes I get guilt for repeating things, ’cause I sometimes think you people are gonna think, “Come on, Rush. You’ve said that! You’ve said that so many times. Move on to something else.” But I have learned how often you have to say things in certain instances for people to hear it and how often you have to repeat things so that everybody in an audience can hear it. I keep hearing from the students and from media people and activists that the sole problem here is the NRA. I just was watching some argument on CNN, and there was some babe on there and the only thing they could say was, “NRA! Stop the NRA! 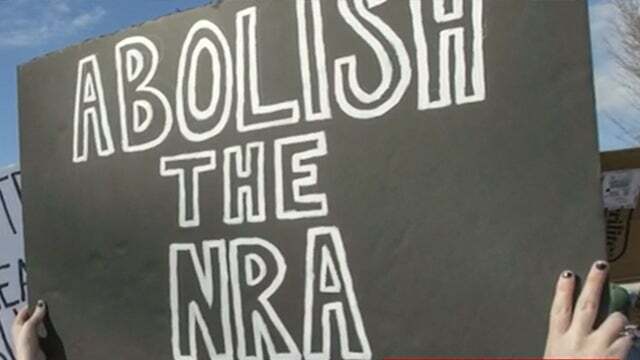 Fund opposition to the NRA! NRA this. NRA that. Congress is in the back pocket of the NRA,” blah, blah, blah, blah, blah. That isn’t true. The National Rifle Association is a gigantic organization, but it is nowhere near the biggest spenders in terms of political donations. One more time. Over a 20-year period from 1997 to 2017, something like that, the NRA spent $200 million on politics. Now, just alone, that sounds like a lot of money, “It’s $200 million over 20 years? That’s… Why, that’s many millions of dollars, Mr. Limbaugh!” Yeah, it is. But in one year, in 2017 alone, American unions spent $1.7 billion. In one year! It takes the NRA 20 years to spend $200 million. The idea that the NRA is leading the pack of political donations and therefore has a bunch of members of Congress on a leash simply isn’t true. That’s not where the NRA derives its strength and its power. It derives its power because it is one of the largest grassroots organizations in this country. The number of voluntary members from all walks of life, from all 50 states, from all over this country make up a magnificent dynamic and huge membership roster. Many members of unions are forced. They have to become members,and their dues are confiscated for political donations and other usage. This is not how the NRA does business. But it doesn’t matter, because you’ve got people lying about them and mischaracterizing them, and it’s been going on for decades. And they’re not even interested in the truth. So now it’s understandable the students would hate them. But the NRA is not where the solution to this resides. The NRA isn’t pulling the trigger. The NRA is not advocating gun usage like this. The NRA doesn’t have any fingerprints on this. And yet, if you listen to the media and the Democrat Party, the only culprit here is the NRA. None of thinking the left proposes as an answer to one of these horrible tragedies, none of it will work, none of it will make a bit of difference to stopping the next one. And it’s insulting my intelligence and probably yours to have to sit here and put up with listening to it all the time and then having it amplified by a bunch of sycophants in the media. RUSH: Okay. So I’m just informed here that the communists over at PMSNBC are plastering my picture all over their infested video broadcast with a commentary that I am blaming the protest kids for operating right out of Democrat Party playbook. I’m blaming the kids for nothing. I am saying the Democrat Party and the American activist community organized Alinsky left has taken over the student protest. And I don’t know whether the students know it or not. And I doubt students do know it. I don’t think they know who Saul Alinsky is. I don’t think they know what community organizing is. Except the ones who do know about it, support it, have been told about it. But I’m not saying the kids are operating out of the Democrat — the kids think they’re being apolitical here, folks. The kids, the students, they think they’re operating above politics. They’re saying, “We want politicians of both parties to set their differences aside.” And then they start espousing the Democrat Party agenda ’cause that’s who’s organizing their activities. The whole point is that the protests that are happening here today are being portrayed as not political. “The only sick people engaging in politics are the people commenting on it.” It’s a time-honored trick. You take some innocent victims and whatever they say and you proclaim that to be above politics, while all it is is politics. But it’s inoculated. It’s protected. It’s insured. That’s exactly how they do it. It’s just like Michael J. Fox, claiming that he wasn’t engaging in politics, doing ads for Claire McCaskill in Missouri. “It wasn’t political, Mr. Limbaugh. That was your mistake.” It wasn’t? He’s doing a political commercial. I’m not saying the kids, the students are operating out of the Democrat Party playbook. I’m saying their event has been hijacked. And I don’t even think that that is arguable. 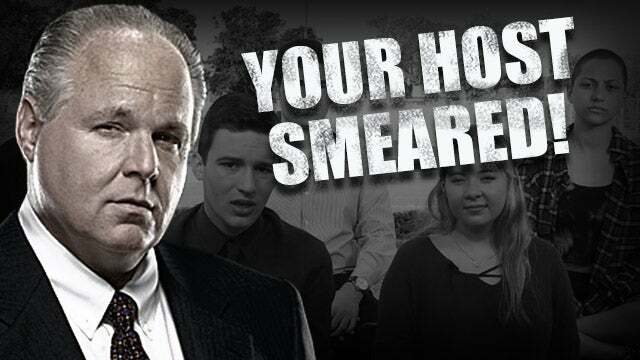 RUSH: The Democrats, the left, they always hide behind children or victims. In this case, both, because it makes them beyond criticism. That’s exactly what they’re doing here.